PandaTip: This template is designed to streamline the contract creation process. First, fill out the tokens on the right. Second, fill out the pricing table below. Finally, hit “send” so that your customer can add their information and electronic signature! PandaTip: It’s easy to offer detailed pricing for your computer repair services with this template. Use the menu on the right to add more services, discounts, and taxes as needed. Customer agrees to pay the amount listed above for the computer repair services listed. Customer may make payment by cash or credit card prior to picking up their device after computer repairs are completed. Customer agrees to pay the full amount listed plus any other costs approved in writing by the Customer. Both parties agree that no additional services outside of those described in this computer repair contract shall be performed. Any additional services shall require a written customer approval, signed by [Customer.Name] prior to the work being performed. PandaTip: You have rights in the event that a customer refuses to pay for the work you’ve done, and this template makes that clear. Of course, it’s wise to have an attorney review this template to ensure it adequately addresses the contract law in your jurisdiction. [Company.Name] shall not release the device listed above until full payment for approved services is made by [Customer.Name]. Should the customer refuse to pay for services approved and rendered by [Company.Name], [Company.Name] may, at it’s sole discretion, elect to sell the device in order to recoup the unpaid amount. This contract represents the full scope of work and obligation by both parties. No other agreements, written or verbal, shall be held as valid by either party, except in cases of written and signed approval for additional computer repair services. [Company.Name] makes no guarantee with regards to performance of the devices listed above after customer has made payment and picked up the device. It is the customer’s sole responsibility to ensure that the device is completely repaired and functioning properly prior to making final payment. 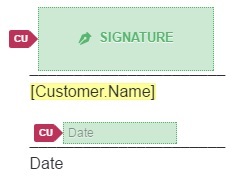 PandaTip: This template includes electronic signature fields, which will allow your customer to sign from any computer or mobile device. Once you’ve sent the completed contract, you’ll be able to track this document as your customer receives, views, and signs it with PandaDoc’s analytics. Customer hereby approves the services and rates listed above, and agrees to respect and uphold the full terms of this computer repair contract.